Can I Become Addicted to Codeine Cough Syrup? Opium and drugs like it have given rise to some of the highest addiction rates in history. Opium addiction rates rank second only to alcohol with scores of people succumbing to the damaging effects of opium-based drugs each year. Considering the bad rap these drugs have had, one may wonder if any legitimate opium medical uses still exist. As a nature-made substance, opium’s chemical make-up shares certain similarities with the chemicals the body uses to manage pain. Consequently, most legitimate opium medical uses fall along the lines of pain-relief remedies. Pain treatments cover a wide spectrum, ranging from over-the-counter products to potent prescription drugs. Legitimate opium medical uses can also be found in the opiate addictions treatment field. Interestingly enough, the same properties that make these drugs so addictive can also help people in recovery maintain abstinence when other forms of treatment prove ineffective. The federal government assigns classifications for controlled substances, which include medicinal drugs and drugs that carry a risk of abuse. According to the U. S. Drug Enforcement Administration, drug classes range from Schedule I to Schedule V, with drugs in Schedule V posing the lowest risk for abuse. Opium medical uses fall within the Schedule II to Schedule IV classes, demonstrating the wide range of treatments these drugs provide. Schedule II opium medical uses include some of the most addictive drugs on the market. In actuality, “medicinal purpose” is the only factor that distinguishes Schedule I from Schedule II class drugs with Schedule I drugs including substances like heroin, cocaine and ecstasy. In effect, Schedule I class drugs carry the highest addiction potential while serving no known medicinal purposes. As analgesics, opium drugs force certain key brain cells to release large amounts of neurotransmitter chemicals, such as dopamine and serotonin. According to the U. S. National Library of Medicine, these chemicals play central roles in the body’s pain management system, regulating nerve cell signal transmissions throughout the central nervous system. These interactions account for opium’s pain-relieving effects. 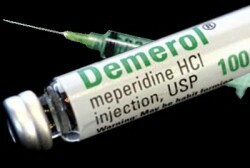 Demerol is an opium drug used commonly for its analgesic purposes. The majority of opium drugs on the market are synthetic formulations of opium, making it possible to formulate different drug strengths. In this way, opium-based drugs can be used to treat most every type of pain symptom, from headaches to cancer-related pain conditions. In cases of moderate to severe opiate addiction, drug effects cause considerable damage to brain cell functions. By the time addicts enter recovery, widespread brain chemical imbalances have taken root. Under these conditions, maintaining ongoing abstinence for any length of time becomes all but impossible. While legitimate opium medical uses do exist, the risks associated with opium drugs in general still apply whether used for medicinal treatment purposes or not. Is Opium Addiction Treatable? - Opium addiction can be very dangerous if left untreated. Luckily, there are a few proven methods to help addicts recover from this syndrome. 5 Signs You Need Long-term Narcotic Addiction Treatment - If you've tried to control your drug use to no avail, and are experiencing negative consequences resulting from narcotic abuse, you should consider long-term care.